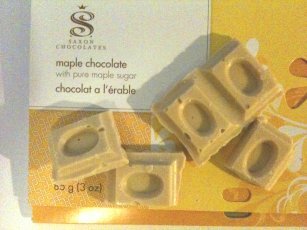 Yes, that’s right, white chocolate with real pure maple sugar! My goodness this is like sugar with flavoured with sugar. Wow. I think I’m never going to sleep again. In fact I think I’ll clean my house, garden and maybe the neighbours too! The chocolate is really not great and the sugar is extreme but the maple flavour is why you’re getting this chocolate bar. No, wait, this isn’t a chocolate bar – it’s a bar of soft sugar. It tastes like maple sugar and is slightly yellow like maple sugar and so you’re getting just what it says on the tin.